After 10 years of experience refining systems and recipes, Bread Poets is proud to announce it is beginning to franchise its retail specialty bread bakery concept. 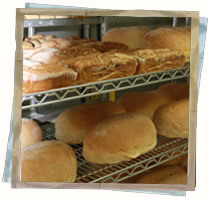 We are a unique retail bakery specializing in fresh, stone-ground whole wheat bread products. 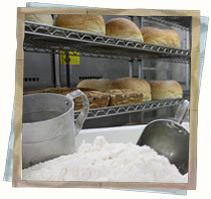 The wheat is milled daily in our bakery to provide the freshest bread possible. 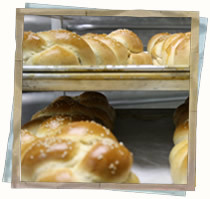 Each loaf is formed by hand, the old-fashioned way, for a bread experience that is truly out of this world! The sight, the sound, the smell and the taste leave an indelible impression on all who walk through our doors. The products are unique only to us and the chatter at the bread board affirms that there is nothing quite like Bread Poets bread. Thank you for your interest in opening a Bread Poets. Whether you want to "roll" in the dough or just make lots of bread – Bread Poets offers a turn-key system for you to realize the American dream. Bread Poets provides a unique opportunity to make an incredible tangible product and immediately see the fruits of your labor – it's hard work but having been in this business for over 10 years, we can honestly say that it is extremely gratifying! We take the franchising end of our business very seriously and are committed to giving our franchisees all the tools necessary to succeed. However, with any business venture, the recipe for success falls squarely on the shoulders of the individuals running each location. There's an old adage in the franchise business – "You're in business for yourself but not by yourself" and therein lies the strength of a franchise system. We've been through many hardships, constantly refined our systems and recipes and basically know this business inside and out. You not only invest in the name Bread Poets and our products, but you benefit from the lessons we've already learned – giving you the advantage to hit the ground running with a tried and true system that works and a product that will simply amaze your customers! If you should be among the chosen to open a Bread Poets you will spend a week in our Bismarck location learning how to run a bakery – from doing the doughs, to baking, to customer service up at the counter – we will cover it all. There will also be office training that covers bookkeeping, recordkeeping, ordering and staffing. Have we peaked your interest? Everything we do is done the right way. We are - Bread Poets. MN, NY, RI, SD, VA, WA, WI, or anywhere outside of the United States. Interested parties must have at least $70,000 liquid capital to invest. Click on Request Information for FREE info on how to open a Bread Poets franchise today! Please Note: This Bread Poets franchise opportunity and other franchise business opportunities, businesses and franchises for sale on this web site are not to be considered as an "offering", "franchise offering", suggestion or recommendation by Franchise Leader™. This advertisement depends entirely on the truthfulness of the information provided by our advertisers which includes, but is not limited to, franchisers, franchise brokers, franchise consultants and business brokers. Franchise Leader™ recommends that you consult a lawyer, financial consultant, accountant or professional advisor before buying a franchise or business opportunity or any type of business. By using this form or any part of our website, you have agreed to all terms and conditions of Franchise Leader™. Please review our Terms & Conditions for more information.